Pawnbrokers in Weybridge? The word brings to mind a rather dingy, Dickensian world, doesn’t it? But Prestige Pawnbrokers in Queen’s Road is not like that. It’s clean, professional, airy – more like a bank or a building society office. Which is exactly the point. 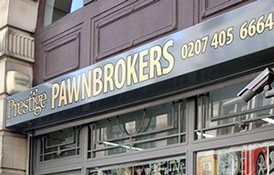 In the modern world, where cash-poor-asset-rich individuals and small businesses have liquidity problems, pawnbrokers can be just like a bank – only more effective. Which is why Prestige’s proprietor James Constantinou set up the business. We all know the old cliché: banks are delighted to lend you all the money you want – as long as you don’t need it. In an emergency many people find that a lifetime’s carefully protected credit rating counts for nothing. That’s one place where they score – the other is cost. Because the loan is effectively guaranteed, interest rates can be as low as 4%. Try getting that from one of our nationalised financial institutions. The Weybridge business has had a storming opening month: examples include a local independent businessman pawning his Ferrari to raise funds to complete a property development project. The client was waiting for funds from a previous deal to be released; Prestige provided a quick and simple solution that avoided a cashflow crisis that could have ruined him. Other items include a pair of classic Harley Davidsons pawned by a dealer looking to raise working capital from his stock – quicker, easier and cheaper than trying to secure an overdraft from his bank. Weybridge, like the rest of the country, is obviously having to tighten its belt. Prestige are providing a valuable extra solution to help people through their short term problems.